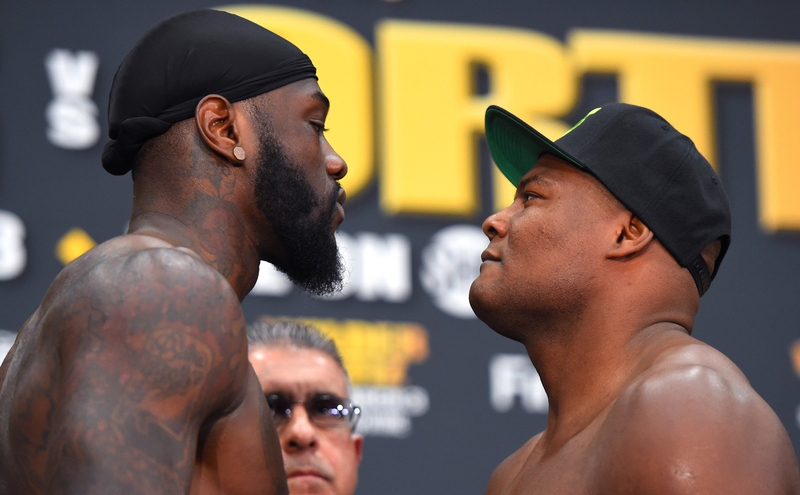 World Boxing Council heavyweight champion Deontay Wilder (39-0) will face what could be his toughest challenge to date when the Tuscaloosa, Alabama, native defends his title against Cuban Luis Ortiz (28-0, 2 no contests) on Saturday night at Brooklyn’s Barclays Center. This fight with Ortiz, which almost didn’t happen because of Ortiz’s failed drug test, is just the latest step in Wilder’s goal of becoming the first undisputed heavyweight champion since Lennox Lewis in 1999. The 32-year-old Wilder is inspired by Muhammad Ali. He and Ortiz are among the new crop of fighters who are being credited with bringing the heavyweight division back into the spotlight. 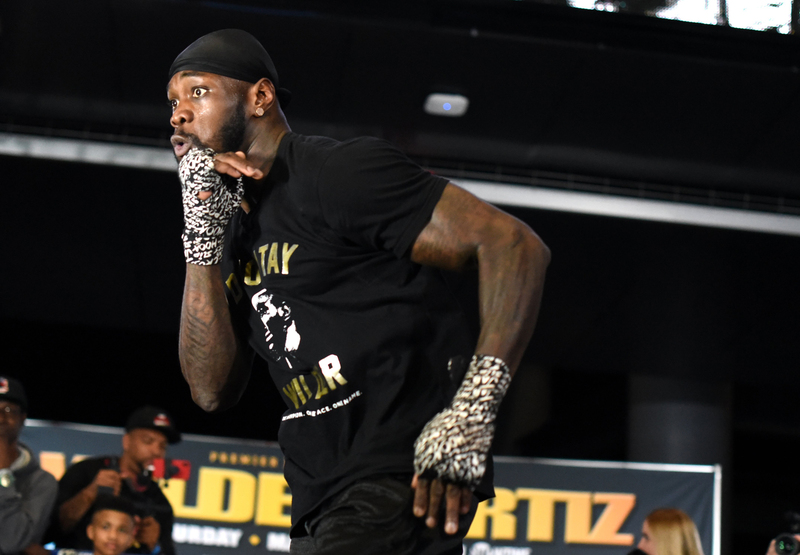 Wilder discussed this weekend’s fight, his plan on becoming the undisputed champion, potential fights down the line and more after a recent training session. You’ve got a big fight coming up with Luis Ortiz. This is the second time you’ve scheduled a fight with him. Talk about the process of putting this fight together with Ortiz again. Basically, after he failed the drug test it was a highly anticipated fight everybody wanted to see. I knew that, and I wanted to fight him too because everybody was labeling him as the ‘boogeyman’ of the division. And I say I’m the baddest, I’m the toughest and I hit the hardest, so I wanted to beat the boogeyman. I got Anthony Joshua [International Boxing Federation, International Boxing Organization, World Boxing Association champion] ahead of me, so I need to put Ortiz behind me. WBC heavyweight champion Deontay Wilder (left) poses next to undefeated contender Luis Ortiz during the official weigh-in at Barclays Center in Brooklyn, New York, on March 2 before they face off Saturday night. Ortiz’s last fight you were ringside, and you confronted him right after that fight. Tell me about that. I pulled his card. I’m trying to unify [the belts]; my main goal is to unify. So when I’m looking at Joshua and I got Ortiz behind him, knowing that Ortiz was his mandatory [challenger], I wanted to do Joshua a favor. [I’ll do the favor] so we can meet in the ring as quickly as possible, so I made it my business to get Ortiz. I want to get him out of the way and take Joshua’s trash out. …. I blessed Ortiz with a second opportunity because I feel like he’s one of the best in the division. I need somebody that’s been highly rated on my record. Every time I’ve tried to fight higher competition, it seems like they failed a drug test or dodged me in other ways. So I’m looking forward to this fight. Talk about Anthony Joshua. He fights Joseph Parker [World Boxing Organization champion] not too long [March 31] after you get in the ring with Ortiz. He has to get that out of the way before a possible fight with you later this year. What are your thoughts on Joshua? I like Anthony as a person. I think he’s doing a great job for his country and what he’s done [in the ring and in the community]. I wish him nothing but the best. But on the business side of boxing, I don’t think he’s very confident as a champion. As a champion, the way that he goes about it is not like champions that we’re used to seeing. When it comes to Anthony Joshua, especially when my name is mentioned or when my name is anywhere in the equation, he changes. Something in his personality changes. I know all of these guys fear me. I know they fear me. I would fear myself if I was fighting somebody that was knocking out everybody that stood in front of him. I’m really convinced, especially at this point, that Anthony Joshua is definitely scared of me. Him and his promoter [Eddie Hearn]. What if the Muhammad Ali we knew never existed? One minute he says he wants to fight in Vegas. Next minute he says he wants to fight back home. He says, ‘We shouldn’t go to America, we should stay here’ (while impersonating Joshua’s British accent). With me, I don’t care where I fight. I don’t care if it’s in the States, I don’t even care if it’s in your country. I’m going to travel, I’m going to go. That’s what I feel I need to do to fulfill my legacy, to leave my stamp on this division and this business. To solidify my name in it, I must travel. You talk about how you’re willing to fly to the United Kingdom to fight Joshua. Another fighter from that same part of the world, Tyson Fury [who was recently stripped of the Ring Magazine and lineal heavyweight championships because of inactivity], has been talking on social media how he wants to get in the ring with you and Joshua. What are your thoughts on Tyson Fury, and would you fight him if the opportunity came about? I like Tyson Fury all the way around, as a person and businesswise. He’s definitely a colorful character in the heavyweight division, and I definitely wish him the best of success. He’s definitely one of the names that I’ve been wanting to fight for years. Me and him always exchange words on social media and likings of that nature. And I still want to fight him. I have no problem with him as long as he gets in shape and gets back in the mix of things. I would love to continue our journey with one another by meeting each other in the ring. That would be better as well because I want to clean out the heavyweight division and swipe it out. Then there would be nothing to discuss as to whether or not I fought the best. You say you want to be the undisputed champion and unify the division. It hasn’t happened since 1999, and the last person to do that was Lennox Lewis. When you think about how long it’s been since there was an undisputed champion, and when you take a look at somebody like Lewis who’s a legend in his own right, what are your thoughts when you put all of that together? My first thought that comes to mind is that it’s been too damn long. It’s been too long for nobody to unify since Lennox Lewis. On the other hand, I do look at Lennox Lewis as one of our greats, somebody that came to America and had dominated at one point in time. He did his thing and he left his mark behind in history. So here I am coming along to do it better than he did. I’m knocking out all of my opponents, and I look to end my career with as many wins [as possible] by knockout and unifying the division. I want to solidify my spot forever in people’s minds as the best to ever have done it. That’s my goal, that’s my mission, and I will accomplish that. How’s training been going for you? Training’s been going great, man. It’s an exciting time. It’s always exciting when we get back into camp. It lights up everybody. Everybody gets a little more pep in their step when it’s time for camp. And we’re ready to battle and go to war. My mind has transformed from the vacation mindset, to “now it’s time to prepare for war” mindset. We’re getting ready, and I’m just doing what I love to do. I can’t complain. I got a job that I love to do, and I’m doing it. It’s a dangerous job, but God blessed me with the talent and ability to do it. Have you felt any aftereffects from your 2016 injury? Not at all. We definitely took time off to let everything heal, especially my bicep. My hand is something I’m used to; this was the third time that I’ve broken it. I’m used to whatever happens when I break a hand, or tear a bicep; you can even come in with burns. It doesn’t bother me because at the end of the day, I’m a warrior. When you’re a warrior you’re going to fight through any situation, any given time, any given place, no matter what it is. That’s what I do. Undefeated heavyweight champion Deontay Wilder throws punches during a media workout on Feb. 28 at the Barclays Center Atrium before his upcoming fight Saturday night against unbeaten contender Luis Ortiz. When you talk about Deontay Wilder, I am so separate among these heavyweights, and even some who came before me. Who else do you know that fights with a broken hand, torn bicep and a third-degree burn in the same night? Some guys turn and break their hand and don’t know what to do. With me it’s the opposite. There’s no limit to what I can do. When I got my mind set on accomplishing something, can’t nobody tell me nothing. I’m just a different breed in this sport, and that’s what makes me who I am. Last year we saw Floyd Mayweather get in the ring with Conor McGregor from the UFC. If there were any heavyweight in the UFC that said he wanted to cross over and get in the ring with you, would you be interested in doing that? If it made sense and the fans wanted to see it like they did with Floyd and McGregor, then why not? It brings a lot of interest when you combine the two [sports] because it’s something that doesn’t usually happen. And when it happens it brings interest. And if there was a heavyweight that was brought up and people had interest, why not? I’m a fighter. No matter what combat sport it is, I’m a fighter. And when you get in that ring or [octagon], whenever you challenge me, prepare for the worst because I’m coming with bad intentions. I know what you’re capable of, you know what you’re capable of. But for those that still doubt Deontay Wilder, what do you have to say to them? If you’re still doubting Deontay Wilder right now after all of the things that I’ve shown you … after all of the knockouts I’ve provided for you, after everything I’ve done in this sport, and you still have doubts? Then watch, baby, because the beginning has just begun. I will unify the division, I will go down as the best to have ever done it, and I can’t wait until March the 3rd because it’s going to be my debut of becoming the undisputed heavyweight champion of the world. I’ll be around for a very long time, as long as I want to be in this sport. I just can’t wait for any challenger, even the ones we haven’t heard about yet. I want to give the world what they want to see, especially what the heavyweight division wants to see. And what they want to see is one champion, one face and one name. And he goes by the name of Deontay Wilder. I ain’t playing around with nobody. Gabe Salgado is a writer and sports anchor living in Chicago.